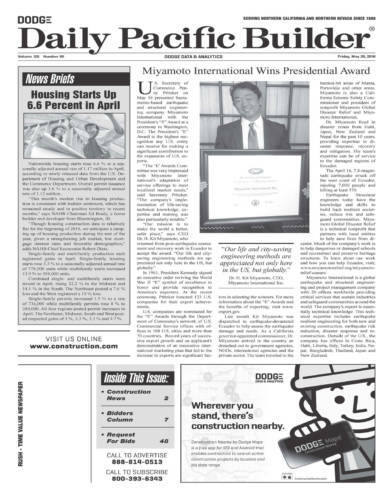 DAILY PACIFIC BUILDER, Friday, May 20, 2016 – U.S. Secretary of Commerce Penny Pritzker on May 16 presented Sacramento-based earthquake and structural engineering company Miyamoto International with the President’s “E” Award at a ceremony in Washington, D.C. The President’s “E” Award is the highest recognition any U.S. entity can receive for making a significant contribution to the expansion of U.S. exports. “Our life and city-saving engineering methods are appreciated not only here in the US, but globally.” – Dr. H. Kit Miyamoto, CEO, Miyamoto International Inc. In 1961, President Kennedy signed an executive order reviving the World War II “E” symbol of excellence to honor and provide recognition to America’s exporters. At the recent ceremony, Pritzker honored 123 U.S. companies for their export achievements. U.S. companies are nominated for the “E” Awards through the Department of Commerce’s network of U.S. Commercial Service offices with offices in 108 U.S. cities and more than 70 countries. Record years of successive export growth and an applicant’s demonstration of an innovative international marketing plan that led to the increase in exports are significant factors in selecting the winners. For more information about the “E” Awards and the benefits of exporting, visit www.export.gov. Last month Kit Miyamoto was dispatched to earthquake-devastated Ecuador to help assess the earthquake damage and needs. As a California governor-appointed commissioner, Dr. Miyamoto arrived in the country and reached out to government agencies, NGOs, international agencies and the private sector. The team traveled to the hardest-hit areas of Manta, Portoviejo and other areas. 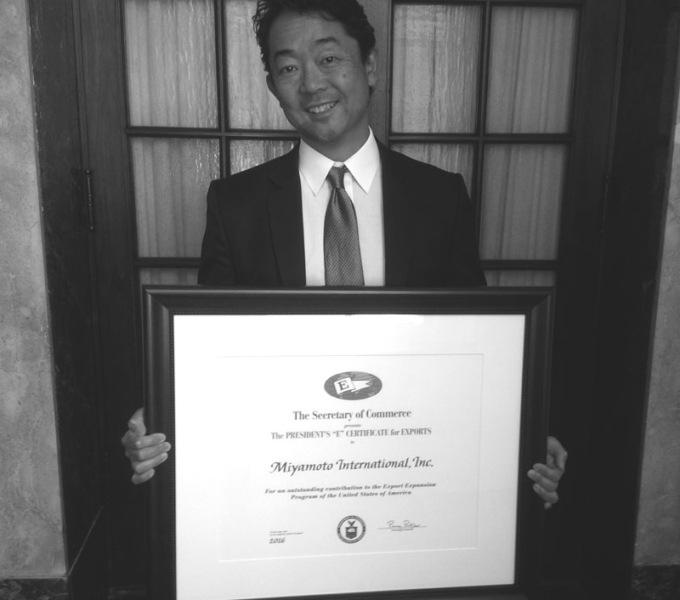 Miyamoto is also a California Seismic Safety Commissioner and president of nonprofit Miyamoto Global Disaster Relief and Miyamoto International, Dr. Miyamoto lived in disaster zones from Haiti, Japan, New Zealand and Nepal for the past 10 years, providing expertise in disaster response, recovery and mitigation. His team’s expertise can be of service to the damaged regions of Ecuador. Miyamoto International is a global earthquake and structural engineering and project management company with 20 offices worldwide providing critical services that sustain industries and safeguard communities around the world. The company’s export is essentially technical knowledge. This technical expertise includes earthquake resilient engineering for both new and existing construction, earthquake risk reduction, disaster response and reconstruction. Outside of the U.S., the company has offices in Costa Rica, Haiti, Liberia, Italy, Turkey, India, Nepal, Bangladesh, Thailand, Japan and New Zealand.